Online retail giant Amazon announced Tuesday it would raise its starting wage for U.S. workers to $15 an hour, amid long-standing criticism of low pay, most notably from Vermont Senator Bernie Sanders. The pay raise will apply to 250,000 employees, starting November 1, and to the more than 100,000 seasonal workers the company expects to hire for the holiday shopping season. Amazon founder and CEO Jeff Bezos said the company, with a market valuation of nearly $1 trillion, heard the complaints about the pay structure. “We listened to our critics, thought hard about what we wanted to do, and decided we want to lead,” Bezos said in a statement. Sanders – who proposed a national $15 minimum wage while running for president in 2016 – had been one of Bezos’ loudest critics. The Senator lead a social media pressure campaign for months leading up to Tuesday’s announcement and even introduced legislation in September called the “Stop Bezos” act, which would tax large companies whose employees rely on government assistance. “Bottom line: the taxpayers of this country should not have to subsidize employees at a company owned by Mr. Bezos who is worth $155 billion. That is absurd,” Sanders said in August, referring to the fact that thousands of Amazon workers rely on social programs such as Medicaid, food stamps and public housing. Following the announcement, Sanders held a press conference and took to social media to celebrate the decision. “Today is not only enormously important for the workers, it could well be a shot heard around the world,” the Senator tweeted. Amazon encouraged other large U.S. employers to follow its lead and said it would lobby US lawmakers for an increase in the federal minimum wage, currently at only $7.25. But the company did not say if it would push for a minimum wage of $15 per hour, a long-sought goal of worker advocates. Amazon’s pay varies by location, so the increase could be $3 to $5 an hour depending on the state. The company – which offers online shoppers an unparalleled combination of ease, speedy delivery and choice few can match – has long faced stinging criticism of its labor practices, including grueling labor conditions and lack of job security. While Amazon portrays the pay raise as a response to those critics, with U.S. unemployment now flirting with historic lows, employers across the country complain they are having difficulty finding enough qualified workers to fill open positions. And some have had to curtail or cancel planned investments as a result. The new minimum wage will also apply to employees at high-end grocery store chain Whole Foods, which Amazon acquired last year, according to Amazon. Despite the tight U.S. labor market and rising after-tax corporate profits, worker pay in the United States has so far risen only sluggishly, leaving them effectively flat when taking inflation into account. President Donald Trump had promoted December’s sweeping tax cuts by saying they would boost worker pay, and the White House has pointed to bonuses many employers have since offered as evidence of increased prosperity. 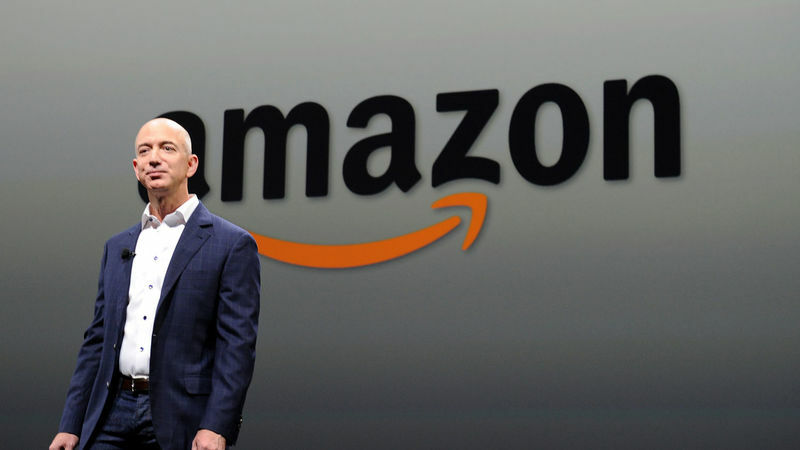 Bezos, a frequent target of Trump’s criticism, is currently the world’s richest man, with a total net worth of $165 billion, according to Bloomberg.